Chelsea vs. Portsmouth : 8 January 2012. In the early rounds of the F.A. Cup, it is all about getting the chance to experience new stadia, or at least getting the chance to venture to towns and cities which have not been visited for years. This has been a relatively new scenario; not so long ago, all we wanted was a home draw against a lowly team in the hope of progressing. However, when Chelsea was entrenched in the old second division, the focus was on getting a big team, with all of the inherent anticipation that went with it. It’s funny how the focus has shifted over the years. In 1982, all we wanted was Tottenham, Liverpool or Manchester United at home. In 2002, all we wanted was Plymouth Argyle, Crewe Alexandra or Lincoln City at home. In 2012, all we want is Bury, Exeter City or Hereford United away. Over 700 teams from across England and Wales enter this competition each year. The diversity of clubs taking part is quite staggering. My local team Frome Town lost in a replay to Basingstoke Town from Hampshire back in the autumn. In fact, Frome’s most famous game in its 108 year history was an F.A. Cup tie with Leyton Orient in the early ‘fifties. Over 8,000 attended that game at Badgers Hill. Not bad for a town with a population of around 14,000 at that time. I won’t dwell too much on how the F.A. cup has seemingly lost most of its lustre over the last 25 years, but it is something that does sadden me. The competition does, at least, open up opportunities for the match-going supporters to get their road atlases out as teams from across the spectrum of league and non-league football are paired together. Maybe this is the lasting legacy of this storied competition; the F.A. Cup Final itself has diminished in importance, but the journey to the final has remained as exciting and as romantic as ever. For example, recent seasons have seen me travel to Barnsley, Coventry City and Preston North End on the F.A. Cup trail and all of my mates crave fresh fields. I don’t expect I will ever reach the vaunted 92 club – I think I’m currently up to about 60 league grounds – but I certainly hope to visit some new stadia over the next few seasons. I’ve never seen Chelsea at a non-league venue (our game at Scarborough in 2004 was our only such game in recent memory in fact) and so I was secretly hoping for an away game at a non-league venue. Salisbury , only 40 miles away in the heart of rural Wiltshire, fitted the bill perfectly. If not Salisbury , an away game at Fleetwood, Crawley, Bristol , Cheltenham, Wrexham, Milton Keynes or Brighton would certainly suffice. Imagine my disapproval when we ended up with a seemingly boring home tie with old adversaries Pompey in our first game of the 2011-2012 competition. Oh well – maybe more enticing draws will await our advancement as the cup progresses. Just the two of us made the trip for the game; I collected Parky at 9am and we were in the café at 11.15am. We were joined by a few friends and Daryl commented that it was 34 years to the day since we defeated European Champions Liverpool 4-2 in the F.A. Cup. Why would Daryl remember this? It was only his second ever Chelsea game. He’s entitled to remember dates like that. Breakfasts were wolfed down and I decided to head on down to Stamford Bridge once again. As I passed the Fulham Broadway tube station, I stopped and had a word with the chap who runs the programme stall. By some bizarre quirk of fate, my old school mate Steve happens to be his postman in deepest Somerset and had often mentioned him in despatches. I introduced myself and we spoke for a few minutes about an event which is planned for Friday 13th. January. None other than Ron Harris is appearing at a fundraiser for Frome Town’s new stand appeal and this chap – another Steve – was thinking about attending. I glanced down at all of the various items of Chelsea memorabilia on display and I thought back to my football-crazed youth. Although I was an avid programme collector in my schooldays – we all were – I limit my purchases to games that I attend these days. I buy every home programme (I must have over 500) but I have stopped buying programmes from most away games. I suppose I must have around 1,500 programmes in total. In those halcyon days of my youth, I used to collect all sorts of bizarre programmes. Amongst others, I have a programme from the 1976 US Bicentennial Tournament and the 1980 Russian Cup Final, plus most F.A. Cup Finals from 1970 to 1982. I have around five Chelsea home programmes from the ‘forties and several more from the ‘fifties. My friend Rick, a Pompey fan, bought me the Chelsea vs. Portsmouth game from the championship year of 1954-1955 as a fortieth birthday present. When I used to travel up with my parents from 1974 to 1980, I always used to disappear inside the old Chelsea Supporters Club premises at 547 Fulham Road (the site of which is now where Mark Worrall has his match day stall.) 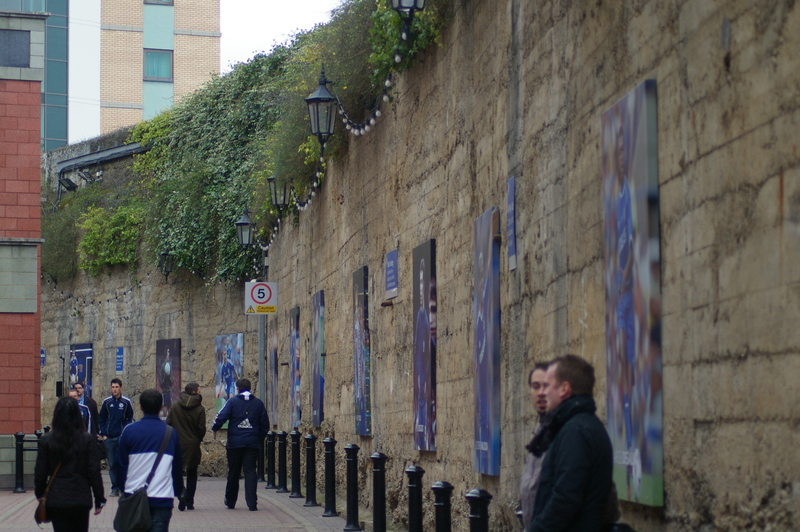 Amongst the usual array of Chelsea souvenirs (silk scarves, rosettes, pennants, bobble hats and gloves) were hundreds and hundreds of match programmes. I have many from the mid-‘sixties through to the present day, but I stopped buying back copies in around 1980. Maybe I should start up again. Daryl has two complete sets of home programmes from that 1954-1955 season, plus one set of away programmes. Gary , too, has thousands upon thousands of Chelsea programmes. My private collection is miniscule in comparison. I noted that there was a home programme from the 1954-1955 season on sale for £25. It made me smart. Even my small collection must be worth around £3,000. I can’t imagine how expensive – or rare – programmes from before the First World War must be. My maternal grandfather attended a game at Stamford Bridge in the ‘twenties; I have a suspicion that it was one of the three F.A. Cup Finals held at The Bridge in 1920, 1921 and 1922. If only he had kept the programme. I used to subscribe to the home programme in the early ‘eighties and I fell in love with the articles written by the late Scott Cheshire about our history. I look back on those days as the start of my fascination past Chelsea players, teams, games and folklore. Through him, I learnt about such players as Tommy Law, George Hilsdon, Hughie Gallagher, Alec Jackson, Vic Woodley and Len Goulden. His words were so evocative and helped me to fully appreciate the trials and tribulations which have so often befallen Chelsea Football Club. Rick Glanvill lovingly continues this fine tradition in the current match programmes. The Peter Osgood statue stood proud in front of the West Stand. Kerry Dixon rushed past on his way to a corporate engagement. I then retraced my steps all of the way along the North End Road and couldn’t believe how busy The Goose was. The Mancunian derby was on the TV and had everybody’s attention. United, of course, stormed into a 3-0 lead. It seemed to be a cracking match and I fully expected United to be hell-bent on getting some revenge for their 6-1 mauling in October. I expected further United goals in the second period. The manager had decided to play an experienced team and I approved. Juan Mata played wide right in Studge’s role, with the recalled Florent Malouda out left. Portsmouth almost scored after just 30 seconds when the flame-haired Dave Kitson (one of the few Portsmouth players that I recognised) raced past a faltering David Luiz but dragged a shot wide of Petr Cech’s far post. Despite a few nice touches from Fernando Torres, the first-half was a very drab affair indeed. Our Spanish centre-forward flashed a header towards the Shed End goal on 12 minutes, but the effort was saved. We passed and passed, but with little invention. A wild shot from Ramires on the half-hour and a strong run from Frank Lampard before the break were the scant highlights. Portsmouth had a rare shot between these two Chelsea chances, but this was skewed wide. Again, I could not believe how often Torres went wide, straying from the centre. I couldn’t believe how laboured our play was. I know that if I was a midfielder in that Chelsea midfield, I would be hitting Torres, or at least hitting the space beyond him, every single time. Too often, Torres stood separate from the action. The bloke needs to be more involved. “We’ll take you on loan, we’ll take you on loan. I think that was the highlight of the half. Garry Stanley, one of the midfield stars from Daryl’s second game in 1978, was on the pitch at the break. I avoided the temptation to yell out “get yer boots on.” All was doom and gloom at the break; the first-half had certainly been a shocker. The second-half was better, but it couldn’t have been much worse. After only a few minutes, a lovely run by Florent Malouda (possibly the first half’s worst performer) deep into the Portsmouth box was followed by an intelligent ball back into the path of Juan Mata. Our little Spaniard slammed the ball in and we were on our way. The next major incident occurred when David Luiz lost possession on the edge of the box. A shot reigned in, but Petr Cech parried. Ward was able to head back towards goal and we all expected the worse. Miraculously, John Terry scrambled back to clear off the line. I’ll be honest, both Alan and I thought that it was handball. For a few minutes, JT lay hurt having collided with the post. I knew that Parky was watching from the front row of the Shed End and I joked with Alan that His Lordship should have lent over the advertising hoardings and offered up a crutch to our captain. The highlights of the rest of the game? How about some mesmeric shimmies from David Luiz on the left wing down below me? It was gorgeous to watch, but what was our central defender doing ten yards from the corner flag? Best not answer that really. Fernando Torres then headed back for the energetic Ramires to stoop and direct a diving header, but the effort was saved. In the last ten minutes, we scored three times and gave the game a rather lop-sided scoreline. Mata crossed for Torres to head down and Ramires was able prod in from close range. Soon after, Torres set up the advancing Ramires who adroitly flicked the ball in with the outside of his boot. With only seconds remaining, Frank Lampard found a spare yard to turn and guide in at the near post. I was more than happy that all four goals had been scored at the Matthew Harding end and I was able to take photographs, of varying quality, of each of the four sets of celebrations. Milton Keynes Dons or Queens Park Rangers vs. Chelsea. There’s that away game we wanted. I hope it’s at Milton Keynes. People might see QPR as “revenge” but I just see loads of aggravation, hundreds of police and tons of nonsense. I hope the “Dons” win the replay and I get to cross off another ground on the list. This entry was posted in Season 2011-2012. and tagged 2011-2012, FA Cup, Fanzines, Football Programmes by Chris Axon. Bookmark the permalink.